Through our expertise and leadership in passenger self-service solutions and equipment, we want to offer a unique and differentiated passenger experience. We are actively engaged in the evolution of technologies and strive to leverage these capabilities in enhancing the overall passenger experience. 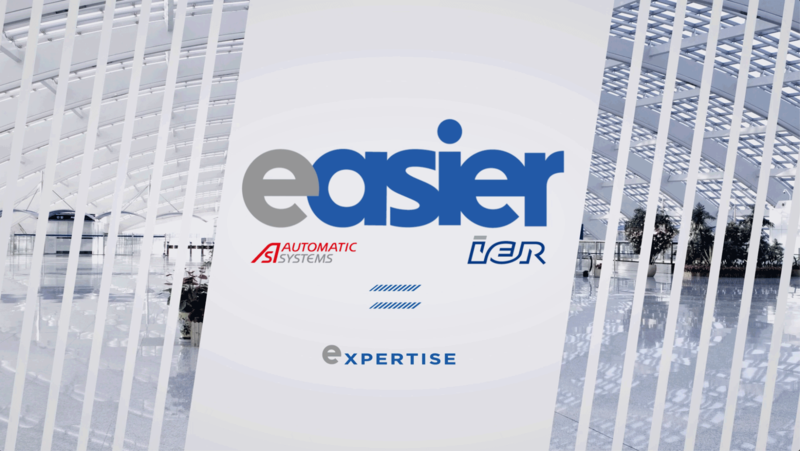 EASIER will enable us to collaborate in developing safe, cost-efficient and value-added solutions, through a dedicated, dynamic and customer-centric organization. Access control and boarding solutions for underground and train stations. Check-in, access control and boarding solutions. Border control solutions in Public Transportation and Airports & Airlines. implemented for Public Transportation & Airline markets. An average of 90 million daily users. We, as IER and Automatic Systems, have lots of joint experience in passenger process solutions across the world. We know what it’s like to travel and how the ground journey can influence their experience as passengers. We have been actively contributing to the ongoing evolution of the industry towards passenger-driven operations. Our know-how is widely recognized by airports, airlines and public transportation worldwide and includes expertise in production, design, delivery and integration of customized systems in the terminal, combined with an extensive range of support services. We have a profound understanding of our customers’ needs and we strive to deliver solutions making their travelling experience more meaningful. Together, AS & IER help customers travel smarter and be in-control of their journey by keeping it simple & smooth. Our vision is to provide travelers with a memorable travel experience from the very start of their journey on the ground. We want to evolve in line with industry vision. Our KPIs mirror a changing landscape, where connectivity, self-service and customer support will reflect the role of an airport, airline or public transport operator as an integrated element of a memorable travel experience. We have a dedicated Solution Design team with tailored services from Project management leadership and steering with assistance and maintenance services, working hand in hand with key industry stakeholders. From integration of biometric recognition systems in our solutions to self-service, EASIER is embarking with airports and airlines & public transportation providers on the digital transformation journey. Our solutions are intended to resolve the capacity issues of congested infrastructures that have to process ever increasing passenger volumes, without compromising their security and integrity, while ensuring that the passenger enjoys a seamless journey. We help our customers improve their bottom line (increase revenues, reduce cost, increase productivity) in designing operational process that fit their needs with exclusive technology (Software, Hardware, Consulting). For Airport, Airline and Public Transportation operators willing to take the self-service experience to the next level, EASIER provides the most relevant offer -from check-in to access control and boarding- based on exclusive hardware, software, and services, helping them reduce costs and increase revenues while enhancing passenger experience. Together, we develop a full range of high-end products that are founded on Automatic Systems’ and IER key strengths: performance, mechanical reliability, single-user detection, innovative style and throughput management. We market and support our products worldwide in a professional manner by relying on a global network of subsidiaries, distributors and service partners. We are a trusted worldwide partner with strong historic legitimacy and our mastery of detection technology and single-user control and leadership in self-service solutions such as kiosks, bag drop, speedgates and entrance control applications for the airline and public transportation sector is widely recognized. Together, we are committed to be your best reliable partner. To make security and border control areas as safe, effective and hassle-free as possible for customers, the industry needs to embrace smart security technology. Our deep understanding of Travel & Passenger industry and market ecosystem is a priceless asset. As globe-trotters and travelers ourselves, we share empathy linked to travel hurdles. We are actively engaged in the evolution of technologies and strive to leverage these capabilities in enhancing the overall passenger experience. An objective that has prompted us to invest heavily in research, development and technology watch. Collaboration is essential to help accelerate technology breakthroughs. We think of air travel as a combined experience of products, services and environments, where passengers can enjoy well-designed self-service technology that decreases wait times, increases throughput and empowers them with a feeling of control.